Bored with the beaches in Bali? Then grab some oars and go on an exhilarating white-water rafting adventure! 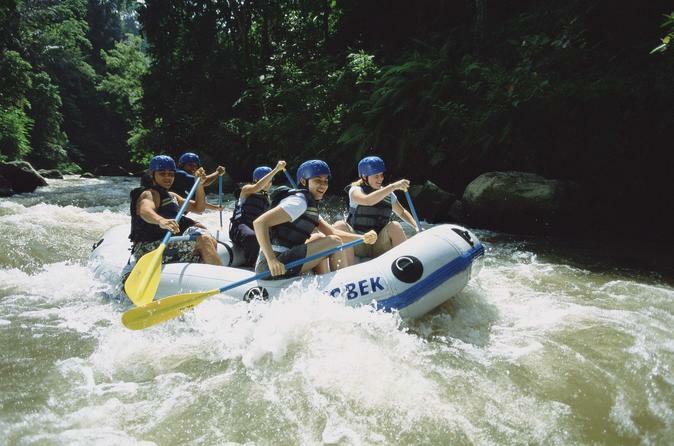 Be challenged by Class II and III rapids as you traverse the Ayung River and paddle through the dense tropical rainforest and deep jungle valleys. After the thrills, relax as you float under cascading waterfalls and see Hindu shrines and various birds, if you’re lucky, you may even see monkeys in the trees! At the end of your exhilarating 2-hour trip, wind down with lunch at the river café followed by a hot shower. Winding its way through Bali’s dense rainforest, the Ayung River provides endless thrills the moment you push off from the riverbank. This fun day out is suitable for all fitness levels, and no experience is required. Start your adventure with a safety briefing from your rafting guide, where you’ll receive your lifejacket and helmet. Then, feel your excitement build and you walk down the jungle path towards the river. After a few more quick safety checks by your guide, you’ll be ready to hop in and start paddling! Hold on tight and enjoy the rush of adrenaline as your raft twists and turns through the foaming Class II and III rapids. Your guide will help you paddle along the river through dense tropical rainforest and deep jungle valleys. Then, relax and marvel at the stunning scenery as you float under cascading waterfalls. See colorful Hindu shrines, lush jungle vegetation and wildlife; if you’re lucky, you might even see monkeys in the trees! At the end of your rafting adventure, you’ll be rewarded with a hot shower and a scrumptious buffet lunch overlooking the river.